With the release of the HoloLens, Microsoft has put itself in both a great position while giving the competition a serious target to aim for. This is normally the case for anyone that is first to the market with a new idea, and now we've finally got a good competitor HoloLens coming. Stereolabs, a company known for its impressive 2K stereo camera, will be entering the mixed reality head-mounted display space with a Developers Kit as soon as early-2017. While Microsoft had shifted focus awhile ago from the popularity of RoboRaid-style gaming to enterprise uses, Stereolabs will be taking on the gaming community full force, as you can see below in their demo video. 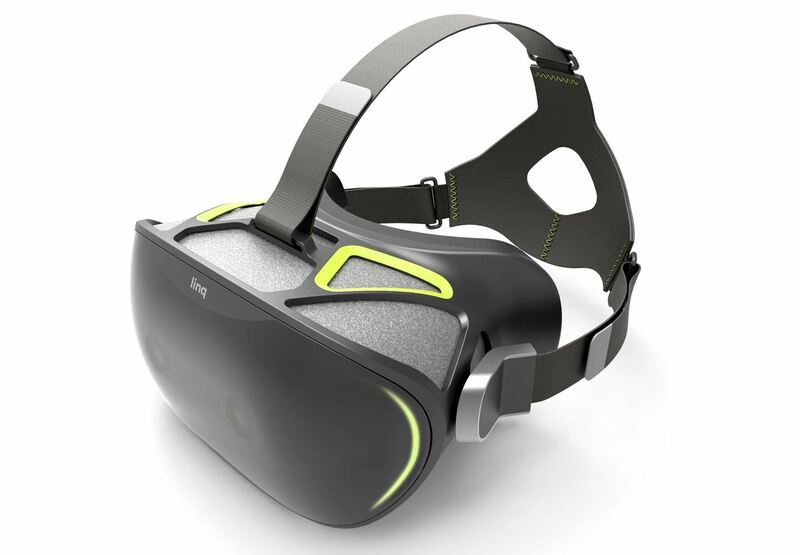 The mixed reality headset in question is called Linq, and will be powered by a souped up version of Stereolabs' ZED 3D camera which can perceive people and objects at up to 65 feet away. Stereolabs (not to be confused with the experimental, art-pop band Stereolab) will be releasing a Linq Developer Kit within months. The magic comes from Linq's front-mounted sensor, a special version of Stereolabs' ZED stereo camera that replicates the way human vision works and perceives the world. Linq's built-in camera scans the environment in real-time and provides 6DoF inside-out world-scale positional tracking without the need for any external sensor. Users can walk, jump, crouch and even dodge projectiles, with every movement captured in the MR experience itself. They don't need to map out the entire playing field first in order to play. The sensor technology stands in contrast to the IR-based sensors of most headsets: it works indoors and outdoors, at longer ranges, isn't subject to interference from other sensors and is cost-effective. The Linq Developer headset will need to be tethered to either a Windows or Linux computer, but Stereolabs told Engadget that the final version will have a small pocket-sized housing for the GPU and battery, so it won't need to be tethered to a computer to function. OS support aside, the Linq will also work with both Unity and Unreal as development platforms. Of all the specs that ZED camera offers, the one that stands out to me the most, as a developer, is the "Depth perception indoors and outdoors." While many HoloLens developers, including myself, have done outdoor testing (for things like landscaping), there have been a few reports of overheating and other failures when leaving an indoor environment. So how much will this thing cost? Engadget reported that "the Linq will cost about the same amount as a gaming console," though no exact figure has been decided yet. The retail price of the ZED 3D Camera is $449 by itself, which is already more expensive than most gaming consoles, so it's likely the Linq will be even more expensive. If you're interested in developing for Linq, you can sign up on its website to see when the Dev Kit comes out. Do the old Vuzix-like enclosed VR-style head mount with camera headset have a chance against HoloLens? Does a wider field of view and the ability to go outdoors make that much of a difference? Let us know what you think in the comments below. News: What's the Difference Between AR, VR, and MR? News: The Government Is Coming for Your HMDs! News: Why Is Most HoloLens Development Happening in Unity? News: Will the HoloLens Forget About Gaming?